These Durable Packaging BT-6 interfold bakery tissue sheets are perfect for your bakery, market, grocery store, cafe, or deli! Thinner than your standard weight bakery tissue, these sheets have increased flexibility, making it easier and quicker for you to grab items out of display cases. Their interfold design also allows for a fast operating pace. As you pull once piece out, the next piece pops right up so you can quickly grab your baked good and place it in its box, bag, or other container. Great for sanitary pick-up and handling of goods from counter to customer, these bakery sheets are a necessity for any bake shop! We purchased this bakery tissue paper for our coffee shop to be put under the pastry display as well as use them to serve to customers. Great product and price. Highly recommend. Again this is my second time purchases these item. Very very good quality. I'm sure I will purchases again soon. Thanks you so much for the good price. This product is the standard bakery tissue that we have used for years. There is one difference though......It's only a third of the price! We will be purchasing these from now on! Thanks again, Webstaurant. Very impressive! The package design is perfect. It is really easy to grab one from it. The quality of papers itself is also at high level. Baking had become even more pleasant. We have purchases for the past year and they are great for our coffee shop. We use them to cover the trays in our pastry case as well as using them to serve customers. The last purchase we found that the tissues are not as wide as they were before. We were able to cover the whole tray with 3 sheets and now it is running short. I am sure this was cost saving attempt by the company thinking the customer wouldn't notice, but I noticed. Otherwise, these are a great product. Thank you for your review, Sam! We are sorry this Durable Packaging BT-6 Interfolded Bakery Tissue Sheets 6 inch x 10 3/4 inch - 1000/Pack has not worked well for you. A Customer Solutions Representative will contact you soon! Quick easy deli tissue for bagging pastries. Use these daily at our bakery and always use this brand. Have never been disappointed in the quality or price. I really like the convenience of the pop up box, the quality of the paper itself. I use these to line the bottom of dessert boxes and they work well. These are not as thick as expected but does the job well enough. The price is better than what you find at local restaurant equipment shops. You really cannot beat the price on these. They come out easily and do the job to keep grease out of serving boats...etc The size is amazing and so is the dispensing method. This is definitely one of if not the best price I've found on this stuff. It's good quality and I like that they come in big packs so I'm never out! This bakery tissue is exactly what I needed! Frankly, any bakery tissue would have done the job, but I landed with this one. Just as expected. These are your standard bakery tissue sheets and do the job well. The price here is competitive/comparable to local restaurant supply stores in my area and buying from WebstaurantStore saves me a trip! While we use these to grab various things from the bakery case, we love cutting/tipping the sheets in half and placing underneath sticky/messy items such as cinnamon rolls. It's such an amazing value with 1000 sheets per pack. The economical price is great for charity events and other school events. Perfect size for small treats. These bakery tissue sheets by Durable Packaging are so convenient and versatile. They can be used inside take out boxes, or just by themselves for baked goods, bagels, or other snacks. Great brand of tissue paper. Perfect for lining our cookie containers as well as separating products that we box for take out orders. Great price for a great product! They are the perfect size for grabbing bagels, muffins, and turnovers out of the bakery case. It is also nice that they don't stick in the box! We use this bakery tissue paper for so much! It is great quality and the interfolded sheets make each sheet very easy to grab! Perfect for all of our self serve bakery products. These have become a staple in our bakery. We hand individual pastries on these when customers purchase one item to eat while waiting or when we hand out samples. Great quality and extremely useful! Will be reordering for sure. Very pleased with these bakery tissues. We've been using this brand for over two years now and very happy with them. They are the perfect size for use at our farm stand for picking up donuts, cookies, and pretzels for customers. These are much easier, less expensive and less wasteful than putting on plastic gloves for each item. The box holds 10,000 and lasts for a long time. We use these for a liner for our hot dogs and find not only does it keep the packaging cleaner, it also looks really nice with an extra touch. Would recommend. These papers are used to grab bagels, i am in search of small sheets so there is not much waste. we cut these in half and they work great. These tissues are excellent for lining bakery boxes or display trays! Even small banana or zucchini breads wrap up perfectly in them. They make a great presentation for sandwiches on a catering tray, too. We use these tissue sheets to handle cookies and baked goods. They are easy to dispense and offer sanitary protection that is easier to use than gloves. Works great for packaging bakery desserts, specially for the greasy ones because the tissue feels like a wax paper... totally perfect and convenient!!! Good quality for a great price!!! Great, cheaper alternative to our old bakery tissue we used. We go through quite a bit of this at our coffee shop, and we were paying way too much. These sheets come at a great price and are wonderful quality. Recommended! Owning a nap for eating a small bakery I shopped around for bakery tissues in many local stores, these are great product at a great price. These are just like the ones you see in restaurants and bakeries everywhere, and they aren't expensive at all! We ordered a case and I'm so glad we did! These inter folded bakery tissue sheets are the perfect size to handle when getting sweets for people and have many other uses! They are a very nice quality and I would totally recommend these to people looking for a great value and quality! Great addition to my dessert shop. These are easy to dispense and the perfect size for grabbing items fro the display case. I will purchase these over and over again. First time ordering this brand of bakery sheets. We just opened the box and found them to be of high quality paper. After testing a few sheets, they hold up very well. We will be sitting to this brand and will be ordering in other sizes as well. Use theses everyday in tha bakery. Good quality, like the size, they fit in the containers very well! Great price and quality. Will purchase this itiem again. Very convenient and much easier than using tongs. I like that they do not stick to the pastries. I also use them to line baskets with sometimes. Purchase a case of these tissue sheets for our specialty pastries and they work great!!! Love the fact that I was able to purchase a case to save a bit of money. Great buy! I don't know what I was thinking to wait so long to order these. There are so many in a box that after two weeks, I still have barely dented the box capacity. I wanted something that was lightweight but grease proof and these fulfilled both of those requirements. I have never been disappointed with anything I have purchased from Webstaurant.com. These are so time saving! I used to cut parchment paper to line my boxes, now I pop one of these in and I'm saving money when I use them!! These papers are great for lining the containers that hold my baked goods. They add something extra to the presentation and keep the items from sliding around the containers. These bakery tissue sheets are just the right size to line our boxes. We also use them to put on top of our scale when weighing product for customers. Great value. These are great tissues for pastry gathering out of our pastry case! We like the fact that they are white, and don't rip as easily as other brands do. Great price as well! The only bakery tissue I like to use in my displays. Holds up well to warm product and does not leak through. Looks very elegant on the tray. 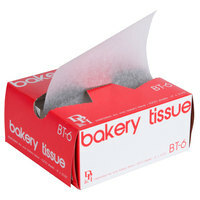 This is your basic bakery tissue that holds together and works well. The box itself lasts a long time before needing to reinforce it with tape. I wish I had thought of The Webstaurant Store for getting bakery sheets sooner! They are a much better price and can be used for many purposes. I use these to handle pastries at my farmer's market stand. Very good quality and the right size for hanging onto pastries and muffins if you don't want to touch them. No complaints here. I'm very happy with this purchase. These are a great size and super versatile. I use them for jumbo cookies, pretzels, pound cake slices... can't be beat. A must-have and cost-effective item for any full-service bakery. We use these to grab brownies, cookies, even cupcakes for our guests. Avoid using your bare hands to handle food and save the expense of gloves. Great product. I use these not just for picking up products and samples. They are also very useful to line your smaller boxes for your treats! love the tissue, feels a bit more like wax paper but it works great for anything and everything. I used them when i was attending a vendor show and sometimes other tissue (because of the ooey gooey food) it would stick but these are not so delicate and hold up really well. These are the perfect bakery tissues to use for handling ready to eat baked goods! Perfect for grabbing freshly baked doughnuts and bagels! Easy to store box!! Bakery tissues are used on just about everything. It's light weight, affordable and good to have, especially when you have guest and customers sample certain desserts. These work great we use them as liners in the fudge and candy boxes as well as liners for our candy trays. They also work as tissues for taking candies out of the display cabinets. I use these tissues to wrap fried pies in and they always work exceptionally well. I made the mistake of using "wet" wax tissues in the past and the sheets stuck together, a problem not encountered with dry wax wraps. Standard bakery tissue. Works well. Easy pull-up out of box. Will buy again. The right size for our uses and the right price for us too. These tissues are great for a variety of applications. Of course they work well for handling baked goods. They also work well to line basekts for sandwiches or line small containers when freezing baked goods. Perfect pastry pulls. Our main food vendor doesn't carry anything like it. I should buy them by the case. They're perfectly thin. Just how a pastry pull should be. When the customer makes a selection, I use a new sheet to move a baked item from its storage tub into its bag. My hands never touch the food, showing my customers that I'm serious about cleanliness. Small cost for certain customer appreciation! We use these in our small bakery for everything. They are good size and easy to use for picking up cookies and pastries, also great for lining our pink bakery boxes for cake slices and pie slices. Very high quality and great price. We use these in the bread baskets. They are also great to serve the kids meal in a lined basket using these. Easy to use for hygenic purposes when handling food products and baked goods. Also useful for lining the bottom of bakery boxes when packaging baked goods. Each sheet dispenses easily. This is a great deal. We use this paper for our customers to get donuts out of the display case. The paper dispenses out of the box and works great. Essential bakery tissue--fair quality, good price. There isn't much to say about it, but I bought it along with a bunch of other items I needed, so it was good to restock on this, too. Webstaurant Store is great!